The 7th generation Volkswagen Jetta facelift is expected to arrive to India soon. After 2011, there have been no changes made to the VW Jetta being sold in India. The long overdue facelift will be more than just a cosmetic job though. The new car is expected to get lot more under the skin to ward off competition from its rivals like the Chevrolet Cruze, the Skoda Octavia and the Hyundai Elatra. 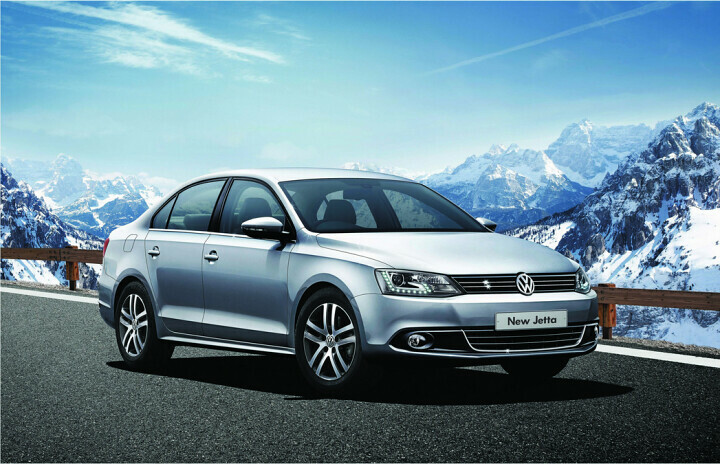 Volkswagen India has launched the Volkswagen Jetta facelift in the Indian market. The car, as expected gets very subtle design changes on the outside and a host of new features. The Volkswagen Jetta Facelift is priced between Rs. 13.7 Lakh and Rs. 19.43 Lakh ex-showroom Delhi, is available with two engine options and three trim levels are on offer. On the design front the only addition seems to be Xenon headlamps along with LED daytime running lamps and the new 16-inch alloy wheels. The engine options are carried over from the previous car. So you get a 140 BHP / 320 Nm 2.0-litre TDI engine and a 121 BHP 1.4-litere TSI engine. While both are available with a 5-speed manual transmission, Volkswagen will now be offering the 2.0-litre diesel with a 6-speed DSG dual-clutch transmission along with paddle shifters. When mated to the manual transmission, the diesel motors returns a fuel efficiency of 19.33 KMPL while the petrol motor gives an efficiency of 16.96 KMPL. So, a host of changes make the Jetta a better car than before, and no longer looks that similar to its smaller cousin the Vento, but does it have what it takes to give its competition a tough time? We will find that out in a detailed comparison later. Meanwhile let us know what you thin of the car in the comments section below. Talking about the changes, let us start with the ones on the outside. On the exterior, the car will be growing in length as well as in breadth. A significant change will be the new L shape, day time running LED lamps, it will also get Xenon projector headlights with headlight washer, just like the one found on the Volkswagen Passat. The rest of the bodywork may not be fiddled with. VW will offer a new set of alloy wheels for the car. On the inside, automatic climate control will be present on all the variants. Bits of chorme will be added around the car to make it feel more premium. The rest of the interior will look the same, there will be small design details added here and there to keep the interiors looking fresh. All the models will come with dual front, side and full length side curtain airbags for passenger safety. The VW Jetta facelift will have the same engine options as in the current car – one petrol and one diesel. The petrol variant will be a 4 cylinder, 1.4 liter TSI motor which can deliver maximum 120 BHP of power and 200 Nm of maximum torque. This will provide a mileage of 14.69 KMPL. On the other hand, the diesel variant will be powered by a 2.0 liter TDI engine which can generate maximum of 139 BHP of power and 320 NM of torque. The diesel variant will come with 6 speed manual transmission as well as 6 speed DSG options. These options can give 19.33 KMPL and 16.96 KMPL of mileage respectively. Volkswagen has not yet confirmed when the Volkswagen Jetta facelift will be launched but according to reports it could be in showrooms by end 2013 or early 2014.